Learning takes time, patience, information and curiosity. 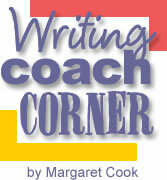 Read through the past writing coach columns, and you will see a variety of suggestions to motivate you to write regularly and to plan ahead. Planning is a key to productivity, but it sometimes seems counter intuitive for CREATIVE people. This column is encouragement to get creative in how you understand and utilize your own writing process. Learning what will work for you is a valuable investment of your time and energy. If you know what helps you, you can reliably do the things that move your writing projects along well. Take time to look through writing books and some of the internet resources on Creative Writing. Sometimes I hear writers complain that traditional outlining is too linear and does not fuel creativity. The recent Internet resource lists help introduce you to graphical maps/organizers and tools that are a great way to be creative in the pre-writing process. One writer I work with uses what I consider a “combined” approach. In her pre-writing she incorporates some brainstorming. She revises the brainstorming into some key images and specific phrases. Then she organizes the images and phrases into the order she will use them in the article (like an outline, but less formal and in some ways more specific). She composes the article then and includes the phrases she developed in the pre-writing. Using this approach, she has been able to increase her productivity and cut her writing time substantially. There is not a universal method to producing writing. You have to see what works for you and be willing to learn from each experience you have in life and in writing. Maybe you have avoided using any process. This does not give you more creative latitude, instead it consumes creative energy. Having discipline or a systematic way of approaching anything is an important step in gaining efficiency. The more systematic you are in some of the fundamentals, the more energy you will have for the skills that can make your writing outstanding. Good basic habits are the foundation for wonderful results. Test the theory out in your own writing. Write an article for NSOF with whatever approach you think is creative. Keep track of how much time the writing and editing takes from start to submission. The next month, write an article using one of the planful methods that appeals to you. I look forward to seeing the articles and hearing about your experiences. Copyright © February 24, 2007 – Margaret Cook. All rights reserved.